The shipping charge for all online orders is $8.00, regardless of the size of your order. Packages are shipped within 1 to 3 days of your order and make their way to you within 2 to 4 days. To receive news about sales, new products and other encouragement, please subscribe here. Please click on these small images to view larger versions! O satisfy me is from the Florals 2 Collection. This verse is a daily reminder that God’s love brings the deepest satisfaction. Use for quiet greetings, joy and friendship. This high-quality art card measures 5½ by 8½ inches and includes an envelope. Great love is from the Florals 2 Collection. Use for birthday, celebration, praise, baptism, renewal, His love, friendship. 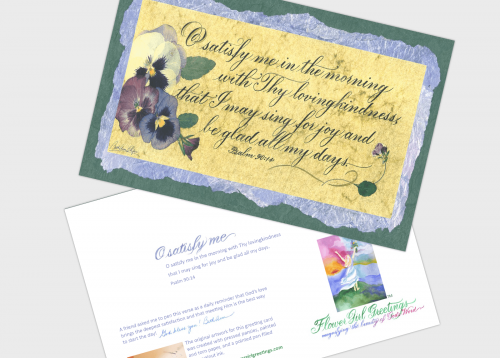 The Scripture art in the three Florals Collections is composed of pressed flowers and pointed-pen calligraphy. This graceful script writing flourished in the late 1800s when master itinerant penmen promoted their styles among students and in business. The harmony and motion of these letter forms combine perfectly with floral designs. These high-quality art cards measure 5½ by 8½ inches and include envelopes. Subscribe to receive notice about new cards, sales, and other news!